It’s been 70 years since the liberation of Leningrad, which is now known as St Petersburg. This article is dedicated to all those that lost their lives and suffered during the siege by the Nazi Army. 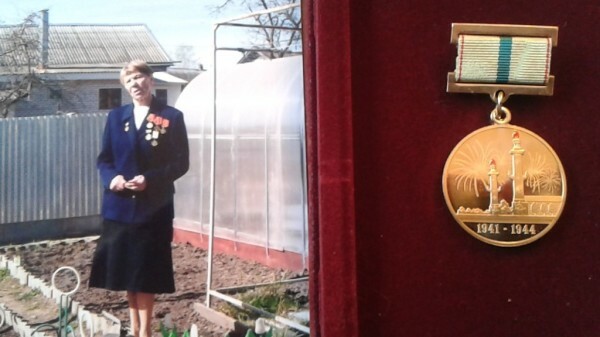 Recently I had an opportunity to sit down and have a conversation with an aging woman who showed me the medal she was presented in commemoration of her survival and 1944 liberation of Leningrad. This daughter of a liberated city asked me to leave her name out of this story, but was willing to let me post her picture along with the award she was presented. She told me stories of the suffering she experienced as a young girl and how frightened she was when she was removed from the besieged city. Famine was rampant, and people did what needed to be done to survive in such an awful environment. It was too much for any person to experience let alone a little girl. My friend is aging now and although her eyes are still bright with enthusiasm, they have become foggy over the years. I was born and raised during the Soviet Regime and have seen pain, suffering and want of my countrymen, but nothing to the caliber my aging countrywoman experienced. I look to the younger generation and hope that they will not forget the pain of the past in hopes that it will not be repeated in the future. It is my hope that the stories I share during excursions, stories such as my countrywoman shared with me, touch the heart of our guests to our city. Many times, people whom I guide have no idea how close the Nazi Army came to the downtown or that palaces such as Peterhof and Catherine’s are reconstructions, because they were burned to the ground by the Nazi Army. Only with desperate attempts were some of the interiors saved by moving them or burying them. Others were lost or destroyed forever. For example, although the original panels of the Amber Room probably still exists, because they were removed before Catherine’s was burned, its actual whereabouts are unknown. The panels displayed in the Amber Room today are reproductions. Many of my guests are in shock to see the repairs on the damaged massive columns of St. Isaac’s Cathedral and many are in disbelief that part of the roof of the Hermitage was used to grow vegetables in a desperate attempt to feed people. Leningrad was my city of birth, a city which I now proudly call St. Petersburg.